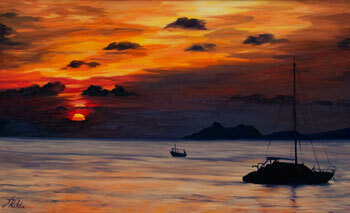 Boats gently rock in the calm ocean as the sun sets beyond the tip of Bonaire. The outline of Brandaris in the north of the island can still be seen in the distance. The sun sets in the clouds gathered at the horizon with a fire like glow but the sea has already cooled to dusk. 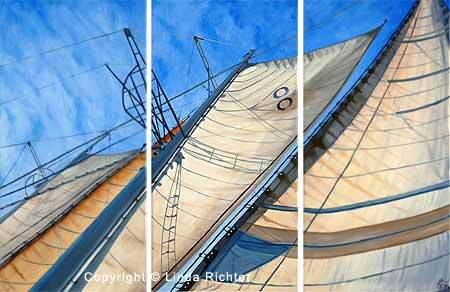 Sails catch the wind against blue sky – shadows of lines fall across the weather streaked cloth. Aboard the windjammer S/V Polynesia, sailing is truly part of the experience as you travel between the beautiful islands of the Caribbean. 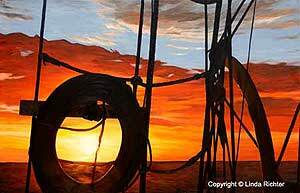 Oh to catch the sunset through the rigging of a sailing ship, aboard the windjammer S/V Polynesia. 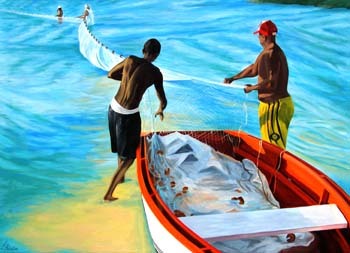 Men gather a net from the shallows of Lac Cai in Bonaire. An experienced fisherman gathers with quiet confidence. A young man eagerly pulls in his side. Experience the glorious colors of a Bonaire sunset as the suns sinks behind Klein Bonaire. The graceful masts of sailboats at rest rock gently in the protected waters of Kralendijk as day flares one last time before night comes. Signed limited Edition prints available together as a Special print $155, or separately as a Medium $75 and a Standard $95 print.